AARP has asked all candidates to take a stand on the vital issue of Social Security. In fact, Hillary Clinton and the 2016 Democratic Party Platform have taken a powerful pro-Social Security stand. For that matter, Donald Trump and the Republican Party have taken a Social Security stand, too, though a disturbing one, which they seem to want to keep hidden from view. Their stand, once understood, should concern every Social Security beneficiary now and in the future. Clinton and the Democrats recognize what most Americans know: Social Security is more important than ever. It is Americans' most important, and often only, source of retirement income, life insurance, and disability insurance. She and her fellow Democrats understand that our nation is facing a looming retirement income crisis, where traditional pensions are disappearing and too many Americans fear they will never be able to retire with dignity and independence. They recognize that our Social Security system is the nation's most efficient, universal, secure, and fair source of retirement income, as well as pre-retirement income in the event of disability or premature death, leaving dependent children. That is why Clinton and her fellow Democrats are committed to fighting to expand Social Security. It is why Clinton and the Democratic Party oppose all cuts, which would only exacerbate the looming crisis. They understand that expanding Social Security is a solution. In addition to expanding Social Security's cash benefits, Clinton and her fellow Democrats are fighting to restore an invaluable Social Security benefit that has been weakened for most Americans and lost altogether for many. That is the benefit of security, peace of mind. Americans should be confident and secure in the knowledge that, if tragedy should strike in the form of premature death, leaving dependent children, or in the form of a serious disabling illness or accident, which makes work impossible, their incomes will be replaced, thanks to the Social Security benefits they have earned. They should be secure in the knowledge that if they are fortunate to live to old age, Social Security will be there, providing guaranteed and timely benefits, month after month for the remainder of their lives. Americans used to have confidence in the future of Social Security. In their recently released book Stronger Together, Clinton and her running mate, Tim Kaine, astutely identify the culprit that has stolen the invaluable benefit of security. Clinton and Kaine spotlight the "years of mythmaking claiming we cannot afford Social Security and that the only solution is to cut the benefits on which 90 percent of American seniors rely." Clinton and her fellow Democrats know what should be obvious to everyone: As the wealthiest nation in the world at the wealthiest moment in our history, the United States can not only afford our current Social Security system, but an expanded one. The debate over whether to expand or cut Social Security's modest but vital benefits is a debate about values and what kind of nation we want to leave those who follow. The false claim that Social Security is unaffordable is, as Clinton and Kaine state, a destructive myth. Rather than having an honest debate over values, however, Donald Trump's Republican Party continues to spread the destructive myth of unaffordability. Trump and his fellow Republicans state in their 2016 Platform that Social Security's "current course" [i.e., keeping our promises and paying the Social Security benefits that hard working Americans have earned and deserve] "will lead to a financial and social disaster." What thin reed are they relying on to spread this image of disaster? When pension plans, private or public, project far into the future, unanticipated surpluses or deficits sometimes appear. Indeed, Social Security is projecting a modest shortfall, around two decades away. How modest is the shortfall? Very. Social Security is close to fully funded for the next century and beyond! Precisely, according to the latest projections, Social Security is one hundred percent funded for the next ten years, 95 percent funded for the next 25 years, 87 percent funded for the next 50 years, and 84 percent funded for the next three-quarters of a century. These projections are unsurprising, unremarkable, and unalarming. Hardly a cause for panic! Not a reason for the frightening "disaster" language of the Republicans. Hillary Clinton and her Democrats responsibly and wisely plan to pay for every penny of their proposed expansions while also restoring Social Security to long-range balance by requiring millionaires and billionaires to pay their fair share for Social Security. About a dozen Social Security expansion bills in Congress doing just that - expanding Social Security while restoring the program to balance - have been carefully reviewed and analyzed by the actuaries at the Social Security Administration. The analyses are available for all to review on the Office of the Chief Actuary's website, at ssa.gov/oact. Clinton and the Democratic Party recognize that expanding Social Security while requiring the wealthiest to pay more is a solution to income and wealth inequality. They are committed to reversing the perilous and immoral rise in income and wealth inequality, where millionaires and billionaires continue to see their vast fortunes grow to unimaginable heights while the vast majority of Americans have seen their income and wealth stagnate or, worse, decline. Expanding benefits and requiring millionaires and billionaires, who have gained so much from our Commonwealth (i.e. common wealth), to pay their fair share for Social Security is not too much to ask. It is an important step in reversing inequality and reducing the squeeze on working families, while putting retirement in closer reach. So that is where Hillary and the Democratic Party stand: In support of expanding benefits, opposed to making our looming retirement income crisis worse by cutting benefits, and paying for every penny of benefits by requiring millionaires and billionaires to pay their fair share. What do Donald Trump and his Republican Party propose? In contrast to Hillary Clinton's and the Democratic Party's clear stand, Donald Trump's Republican Party disingenuously pretends to take no stand. The 2016 Republican Platform meekly and unhelpfully, states, "Of the many reforms being proposed, all options should be on the table." Keep reading, though, and it becomes clear that Donald Trump and his fellow Republicans do take a stand, just one that they want to hide. 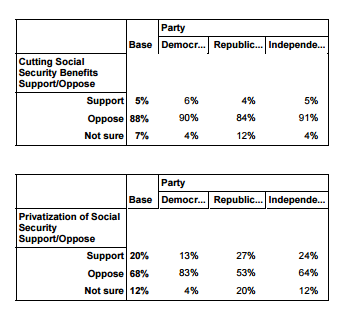 The statement about being open to all options is contradicted by another, more honest, though opaque, statement: "As Republicans, we oppose tax increases and believe in the power of markets...." With coded language and process of elimination, Donald Trump's Republican Party is stating that it desires to cut and privatize our Social Security system. They prefer to shield millionaires and billionaires from an additional penny of tax. Instead, they want to restore Social Security to balance by slashing the hard earned benefits of working Americans, instead. And why refer to the power of markets, except to implicitly express a desire to gamble Social Security's guaranteed, secure benefits, exposing them to the ups and downs of Wall Street? Instead of having the courage to clearly state their honest, though wildly unpopular, convictions, Donald Trump and his Republican colleagues seek to stoke fear. They eagerly and loudly trumpet the supposed "financial and social disaster" they claim Social Security will cause. In sharp contrast, they never talk about the financial and social disaster that already has been caused by Wall Street, a disaster from which so many Americans are still struggling to recover. Instead, Donald Trump and the Republicans seek to shield Wall Street from paying their fair share to Social Security. Indeed, they want to reward that very same Wall Street, allowing them to earn huge fees as they gamble American Workers' hard earned Social Security. Voters should not be fooled by candidates who speak of "saving" Social Security. Nor should they be fooled by Donald Trump's assertions, which he made during the primaries, that he would not cut Social Security. As just discussed, his Party's Platform reveals the truth. Trump's own running mate and his closest campaign advisers all are on record for wanting to cut and privatize Social Security. Revealingly, before Donald Trump started running for President, he was not so concerned about hiding his desire to cut and privatize Social Security. Then, he used a false, derogatory slur, "Ponzi scheme," to refer to our Social Security system and its earned benefits. He said that "privatization would be good for all of us." And he called for raising the retirement age to age 70 because, as he remarked, not worrying about hiding from view the elite billionaire that he is, "how many times will you really want to take that trailer to the Grand Canyon?" Hillary Clinton, and the Democratic Party which created Social Security, will fight to expand benefits while requiring millionaires and billionaires to pay more. Donald Trump and the Republican Party will probably not tell you, but they appear eager to drastically cut, and indeed, dismantle our Social Security system, brick by brick, by handing it over to their Wall Street friends. Seniors and others who care about Social Security should be keenly aware of this sharp difference when they go to vote on November 8. Their economic security - and their family's - will likely rest on the outcome.